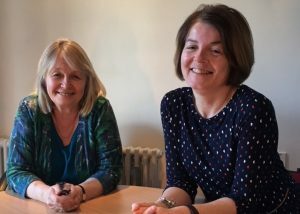 Hello from Fiona and Sarah, your payroll team here at Team 4 Solutions. We know running a business is more than a full time job, but we hope you’re still finding time to enjoy the longer summer days and the good weather. It’s been a busy quarter for us with GDPR coming into force (yes, it’s not only all those annoying marketing emails, it applies to payroll data too) and with the Payroll Year End in March. Payroll year end is done and dusted for 2017-18: we extend a huge thanks to all our clients for sending information on time so all went smoothly. GDPR legislation has just come into force: what we’re doing to keep your data safe. March saw the first reports from last year’s Gender Pay Gap regulations. Charity hike: our very own Sarah hiked 26 miles to raise money for MacMillan Cancer Support. You can find more details on each below and if you’ve any questions please get in touch. The end of March is always a busy time for our Payroll Bureau as we tie up the payroll year end, ready for the start of the new tax year in early April. Each year we must confirm the personal details of all employees for each of our clients. For a client base of approximately 200 companies, that’s a lot of employees! We start the process early so you have plenty of time to respond, saving you unnecessary stress. This year, we’ve combined it with GDPR compliance and cleansed the data to remove any information that isn’t required for payroll, and therefore shouldn’t be shared with us. HMRC have also helped make the end of year submission less stressful. HMRC now requires an update each time you run payroll, so we make sure you stay on top of payroll updates throughout the year. We’re lucky to have excellent relationships with all our clients. By staying in communication all year round, the end of year work is much easier for everyone. We never thought we’d find ourselves ordering chains and padlocks as part of our work! But that’s exactly what we’ve done in preparation for GDPR. Naturally, as we process payroll for our clients, we need to gather and store personal information about your employees and HMRC requires these records are kept for at least 3 years. Things like names, dates of birth, start dates, rates of pay and what an employee has been paid are all classified as personal data. These data must, by law, be held securely both by you and by any suppliers you contract who need access to the information. Where we have paper copies they are now held under lock and key, hence the chains and padlocks. For digital data we have a new secure server for payroll data storage that is only accessible by our Payroll Bureau staff. We’ve also verified that any software packages we use for your payroll, like Sage, are all GDPR compliant. What are The Gender Pay Gap Information Regulations? Did you know the gender pay gap starts in childhood? According to research carried out by Childwise the gender pay gap starts as early as five years old. Girls aged 5-16 are receiving less pocket money per week than boys of the same age. This year, for the first time, businesses with 250 or more employees were required publish their gender pay gap data. That means they must calculate and share the percentage difference between the average hourly earnings for men and women for their company. It’s a social issue that has stirred up a lot of debate and there is more interest than ever in investigating the underlying problems and causes of the pay gap. As an employer, even if you don’t employ anywhere near 250 staff, it’s important to be aware of: employees or job applicants may ask you about it. Our lovely Payroll Assistant, Sarah, strapped on her hiking boots to raise money for Macmillan Cancer Support at the start of July. Many of our clients and friends wishes her will and sponsored her for her hike on 7th July, as part of Macmillan’s South Coast Mighty Hike. If you get in quickly you can probably still sponsor her, find her Just Giving page here http://bit.ly/SarahsMightyHike . Got your payroll sorted, but worried about something else? Don’t forget, we also offering bookkeeping & management accounts services. If you’d like to find out more have a look at our website or contact us for information and a friendly chat.